Fully 63% of Americans approve of the Obama administration’s decision last month to re-establish diplomatic ties with Cuba after more than 50 years. 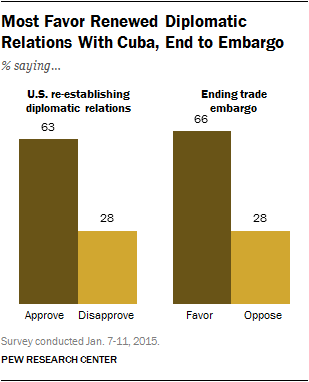 And there is equally broad support for going further and ending the decades-long U.S. trade embargo against Cuba (66% favor this). Yet there is broad public skepticism that a thaw in U.S.-Cuba relations will lead to greater democracy in Cuba. 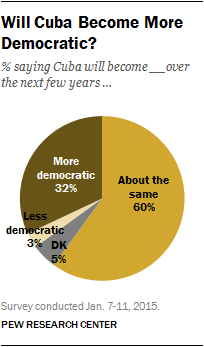 Only about a third (32%) say they think Cuba will become more democratic over the next several years, while 60% say it will be about the same as it is now. Republicans are more divided in their views: just 40% of Republicans approve of the re-establishment of relations with Cuba, while 48% disapprove. There is somewhat more support among Republicans for an end to the trade embargo, though as many say they oppose lifting the embargo as say they favor it (47% each). Just a third (33%) of conservative Republicans approve of resuming diplomatic relations while 55% disapprove; among moderate and liberal Republicans the balance of opinion is reversed (54% approve, 33% disapprove). Similarly, conservative Republicans are less likely to favor ending the trade embargo than moderates and liberals in the party (40% vs. 61%). Support for both the restoration of diplomatic ties and an end to the trade embargo is seen broadly across demographic groups: 62% of whites, 64% of blacks and 65% of Hispanics approve of re-establishing diplomatic relations with Cuba. While majorities of those in all age groups approve of the move toward normalization of diplomatic relations, Americans younger than 50 are more supportive than older Americans: 67% of those 18-49 support the re-establishment of relations, compared with 57% of those age 50 and older, with similar divisions in views about the trade embargo. College graduates are particularly supportive of a restoration of diplomatic ties: 77% approve of the re-establishment of diplomatic relations, while 78% favor an end to the embargo. 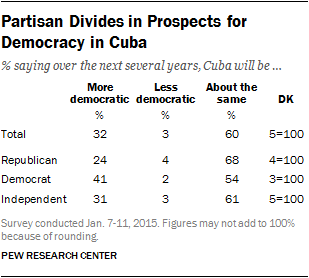 When asked whether Cuba will become more democratic, less democratic or remain about the same as it is now over the next several years, six-in-ten (60%) Americans expect little change, and this is the majority view among Democrats, Republicans and independents. But Democrats are more likely than Republicans to say the communist nation will shift in a democratic direction: 41% of Democrats say this, compared with just 24% of Republicans.